The three side-by-side images below, provided by Mike McKenzie, show the iron furnace in Wellersburg, Southampton Township, Somerset County, PA. Mike received the left-hand photo from Sonny Lee. Mike reports that Sonny's father Roy Lee owned the old stone furnace and surrounding area years ago, and was the individual who donated the land for the ball field and firemans park. Sonny told Mike that his father Roy Lee demolished the original cut stone exterior of the Wellersburg iron furnace many years ago due to its unsafe condition. A copy of this photograph also appears in Roger & Mona Huffman's 2005 book "A Look At Southampton Township Pennsylvania The Way It Used To Be!". For a higher resolution, zoomable 748KB copy of this old photo, click here. For a circa-1913 photo of the furnace, click here. For a circa-1920 photo of the furnace, click here. To see a 1939 aerial photo that suggests that the stone exterior had already been torn down by that date, click here. Mike took the middle photo in June 2009. It shows what the remains of the furnace currently look like. The right-hand photo is enlarged from the older photo. Notice that some of the surviving stonework at the bottom of the middle photo is an exact match to the left-hand arch support in the old photo. With this 2009 photograph, Mike has demonstrated that what is today perceived to be a furnace liner sitting up on a mound/hill is actually the liner sticking up through the rubble that remained after the unsafe outer wall was demolished. The rubble has been there so long that it now looks like a dirt mound. 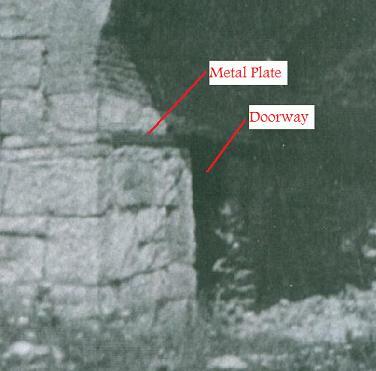 From the old photo, we can see that the cracks above the arch may have been at least part of the reason that the structure was eventually considered to be unsafe. The stone work immediately above the brick arch was not arched, which left the structure weaker than it otherwise could have been. The stones that supported the left-hand side of the arch appear to be cracked due to the massive weight supported by the arch. If a layer of rock above the brick arch had also been arched, the supported weight would have been distributed over more of the supporting rock, resulting in less stress, in pounds per square inch, on the supporting rock. While the structural limitations are interesting from an engineering standpoint, and eventually neccessitated the demolition of a historic structure, the limitations did not, so far as we know, have any impact on the operation of the furnace. A crack above the left and right sides of the brickwork, and along the right hand arch support, shows how much the arch had dropped over time. Additionally, the stones at the bottom of the right arch support were well along in the process of disintigrating. These structural details can best be seen by zooming in on the high resolution copy of the photo (follow the link above). 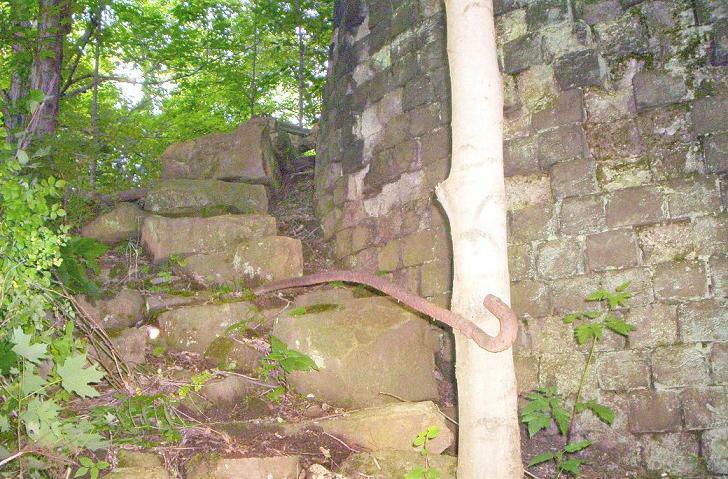 The image that follows is a 2007 photo of the remains of the Wellersburg iron furnace that shows how the fire brick liner appears to be sitting atop a mound of dirt. As described above, this round brick structure is actually the liner projecting out of the top of the rubble that remained when Roy Lee demolished the unsafe outer walls. Click here for additional 2007-2009 photos of the remains of the furnace, taken from various angles. For 2012 photos of the interior of the liner that were provided by Francis Bridges, click here. An enlargement of the old, pre-demolition photo is included below. In this enlargement, a doorway is clearly visible in the left-hand wall of the archway. The purpose of this doorway is unknown; one guess might be that it provided access to one of the blast air pipes. The structure above the doorway is supported by what appears to be a large metal plate (A similar plate is visible on the right-hand wall of the archway). The July, 2009 photo that follows, provided by Mike McKenzie, shows one of the binder rods jutting out of the furnace rubble. Such rods were used to reinforce the masonry structure (for example, see the binder rod escutcheons in the old furnace photo above). The photo also clearly shows what appears to be the remains of a circular stone inner wall that surrounds the brick furnace liner. This wall is about a foot away from the liner. The space between the wall and the liner is filled with material (possibly sand or crushed stone). The stone wall was presumably there to reinforce and protect the brick liner. 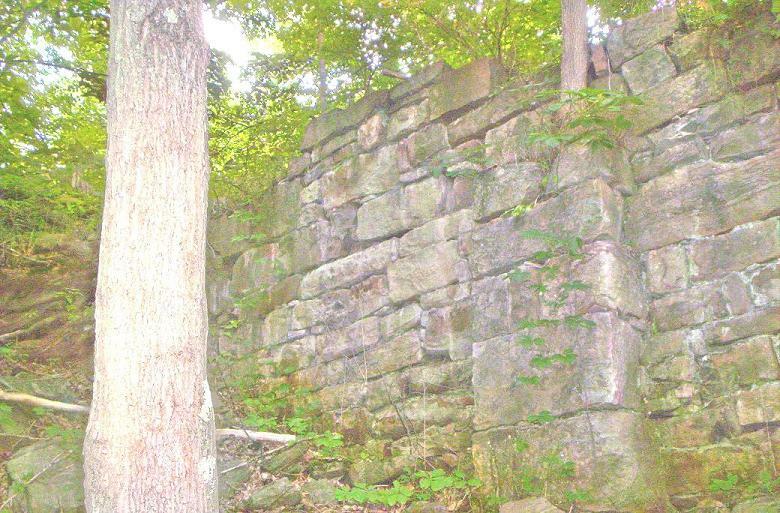 The July, 2009 photo that follows, provided by Mike McKenzie, shows a stone wall that is at least 10 to 12 feet high. As viewed from the front of the furnace, these remains are located to the right rear, and are situated at least 20 feet higher than the ground/base level of the furnace. Mr. Mckenzie reports that there are at least four large anchor bolts to the left of this wall. These bolts are about 1-1/2 inches in diameter, and threaded at the top. They stand nearly three feet from the ground/floor level. Obviously these bolts were designed to locate a substantial piece of machinery, such as the blast machinery, or the steam engine that powered it. For a circa 1920 photo of the remains of this structure, click here. A cave- like stone stable was built under the ramp of the furnace. The stable was connected to the furnace stack. Storage rooms were connected to the stable via stone tunnels. After the stone structure was demolished, a roof, a door, and window, were added to the furnace lining so that the liner could be used as a pig pen. According to the 1992 master�s degree thesis of Joseph Todd Sanders (Mississippi State University), Gettysburg-born engineer Matthew Amos Miller (son of General Thomas Craig Miller) supervised the construction of the Wellersburg iron furnace, and while working there married Matilda Ann Fechtig on December 6, 1855. This marriage date, if correct, suggests that at least some of the furnace construction activities took place in 1855. (Click here to see a web page that lists some of Matthew Amos Miller�s descendents.) 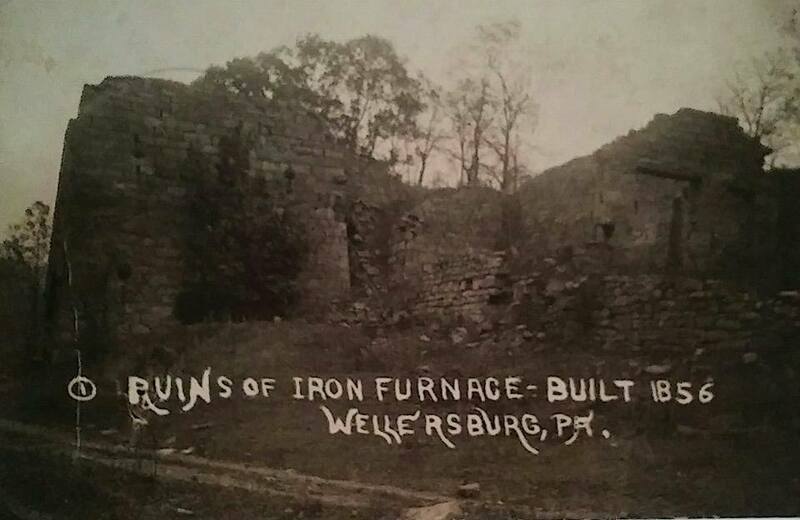 Page 92 of the 1906 History of "Westmoreland County Pennsylvania" indicates that contractor and builder Philip Dom assisted in building the Wellersburg iron furnace. In regard to Wellersburg iron production, the Southampton township section of the 1884 book "History of Bedford, Somerset and Fulton Counties, Pennsylvania" states "The town grew slowly, like most country villages, until the building of the furnace brought a sudden influx of population. The Wellersburg furnace was built in 1855. The Union Coal and Iron Company, its projector and first owner, was organized in 1854. The furnace, when in active operation, produced about three hundred tons of iron per month, and the industry, in all its departments, afforded employment to about two hundred men. The furnace continued in operation at different times, until 1866, when it was abandoned. The collapse of this industry was the death-blow of the growth and prosperity of Wellersburg.". It is interesting that this 1884 article refers to the Union Coal and Iron Company as being the "first owner", because this suggests that some other firm or individual was the second owner. The article also indicates that operation of the furnace was intermittent. Although the aforementioned 1884 article indicates that the furnace was built in 1855, other sources indicate that it was built in 1856, including this 1864 book and this 1876 book. In any case, the furnace was apparently operating during the U.S. Civil War, when iron demand would have presumably been high. It isn't too big of a stretch to imagine that the large influx of furnace-related laborers would have represented a good market for the various farm products that were produced by local farmers. The increased demand for food that would have been created by the Wellersburg population increase would have very likely benefited my own local ancestors, such as Daniel Korns, Jr.. Local individuals probably also provided some of the labor that was required to build and operate the furnace complex. Page 591 of the 1854 "American Railroad Journal" includes an article titled "Coal Railroad to Somerset County Pa." which states "The Wellersburg Railroad, extending from Barrellville to Wellersburg, an intended to connect the mines of the Union Company with the Mt. Savage Railroad, has been put under contract and the work is being pushed forward with a degree of energy that will ensure its early completion. Messrs. Walker, Abernethy, Dudley & Co., the contractors, have at this time 200 hands at work." Click here for fluff piece-type 1856 articles on the Union Coal and Iron Company and the nearby Wellersburg Coal Company. The articles are in a section of the magazine related to coal. The article on the Union Coal and Iron Company states �This company, also located in Somerset County, Pa., is doing a thriving business. The business on the railroad of this company will be much increased by the connection of the tram road of the Wellersburg Coal Company with it. Several members of the Company are prominent merchants of Baltimore, who, with the energy and sufficient capital they posses, can rank their mines among the most important in the coal region.�. For a web page on that railway, click here. To see the Wellersburg portion of the 1860 Walker map, which shows a tram line between the "Shaffer Vein" and the iron furnace, and also shows the railroad line, click here. The Southampton Township portion of the 1860 Walker map shows the spool road that ran north of the furnace, to where the ore was mined. The aforementioned article on the Wellersburg coal Company states �The lands of this company, not many months organized, comprise some 1,200 acres of land in the immediate nieghborhood [sic] of Wellersburg, Somerset County, Pa., adjoining the Union Coal and Iron Company�s property. Very rich deposits of coal of the best quality, have been found in their possessions, together with iron ore of various qualities. They are about constructing a tram road, one mile in length, to connect with the Union Coal and Iron Company�s Railroad, at or near the above place. The company also intend erecting an iron furnace during the coming year, if they realize the success which their prospects now hold out to them. The president, Jos. Souders, Esq., of Philadelphia, is highly qualified for his position, and under his direction, the welfare of the company is secure, and their business must thrive.�. According to a lawsuit by Wellersburg resident John R. Brinham et al., the Wellersburg Coal Company was organized in 1855, and was already having trouble paying its bills by 1859. Click here to see an 1855 stock certificate from the Wellersburg Coal Company. Click here to read an 1857 article from volume 8 of the aformentioned �Mining Magazine�, which states �The Union Coal and Iron Company�s Works...manufactures pig iron only, producing from 70 to 100 tons per week, at a cost not exceeding $15 per ton. They informed me that they had, under contract, disposed of all the iron they had manufactured this season at $25 per ton.�. Click here for a detailed, illustrated 1850 treatise on building and using charcoal blast furnaces. 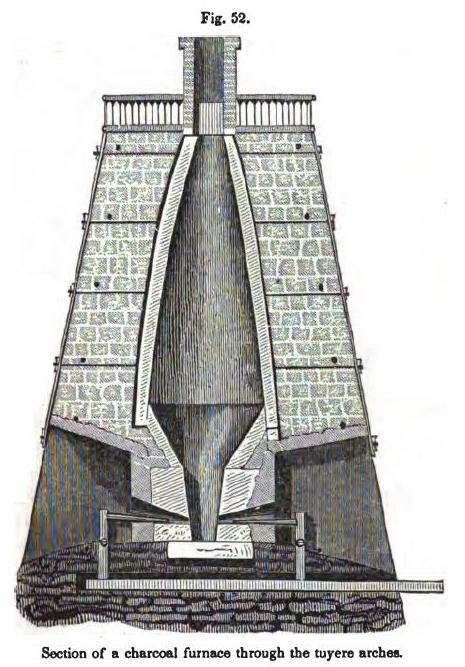 The following furnace cross-section was taken from this 1850 treatise. The 1860 charter of the Somerset Iron and Coal Company seems to indicate that by 1860, the Wellersburg iron furnace was owned by that firm (or perhaps that a second Wellersburg furnace had been built). The charter states �The improvements upon this property justly command attention, being of the best character and constructed at a cash outlay of over $200,000 exclusive of the cost of the land. They consist, in part, of a Hot-Blast Furnace of the capacity of 100 to 150 tons per week; a Steam Engine of 100 horsepower, numerous machinery; a Rail-Road connecting the property with Cumberland; numerous Tram roads; from 20 to 30 good Houses for superintendent and miners� residences &c.; an Inclined Plane to carry the ores and coal to the head of the Furnace; a large number of Cars; Miners� Tools; &c., all in condition for immediate use. Upon this property is situated the thriving village of Wellersburg��. My guess, and it is only a guess, is that the Somerset Iron and Coal Company may have possibly been a successor to both the Union Coal and Iron Company and the Wellersburg Coal Company, combining the assests of both. The basis of my guess is that I don't know of any second furnace being built in Wellersburg. If anyone has information pertaining to a second furnace, please let me know. The Southampton township section of the 1906 book �The History of Bedford and Somerset Counties Pennsylvania� states �All the raw material entering into the manufacture of iron abounds in Southampton township. In 1855 a furnace was built by the Union Coal and Iron Company. This company succeeded an older company, which had extensive mineral rights. For the time being this enterprise brought great prosperity to the village. The furnace had a capacity of about 300 tons per month, and in various ways gave employment to upwards of 200 men. The furnace was abandoned in 1856 [sic], and with it departed the prosperity of Wellersburg, and its population has since dwindled until it has become one of the smallest boroughs in the county.�. Page 529 of the same book states "The furnace at Wellersburg was built in 1855 by the Union Coal & Iron Company, organized in 1854. When in active operation it is said to have had a monthly capacity of three hundred tons. The furnace does not seem to have been operated continuously, and eventually passed to the ownership of Ross Forward, of Somerset, who abandoned it about 1866. Years ago, in localities away from Wellersburg, it was a matter of common report that the immediate cause of its abandonment was that while in blast the furnace had chilled. In connection with the development of the mineral resources of that part of Somerset county in which this furnace was located, it may be said that as early as 1808 the Juniata Stone Coal Company owned land in Southampton township, which land was afterwards sold by Dr. John Anderson, of Bedford, as trustee of the company.". Chapter XV of the book summarizes the 1800 to 1900 censuses of Somerset County, Pennsylvania. Page 182 indicates that the population of Wellersburg was 465 in 1860, and page 185 indicates that the population had dropped to 290 by 1870. As noted above, the the 1906 book �The History of Bedford and Somerset Counties Pennsylvania� states in regard to the Wellersburg furnace "...the immediate cause of its abandonment was that while in blast the furnace had chilled.". In 2009, Mike McKenzie indicated that the furnace liner is filled in, creating a �floor� of sorts. I infer that the material filling the liner today is the simply the ore charge that was present in 1866 when the molten metal within the furnace chilled (i.e. solidified). Why would a furnace chill while in operation? I certainly don't know what happened, but a preliminary guess would be that there was some kind of problem with the steam-powered blast machinery, causing the furnace temperature to drop. The May 1960 issue of the Laurel Messenger gives a particularly succinct description of how the old iron furnaces were operated, stating "The furnace stacks were hollow from top to bottom and into this cavity was dumped from the top the ore, charcoal and limestone to flux the ore. Then the blast was turned on and a roaring noise and stream of sparks resulted. The blast was kept up day and night until the ore had gradually been extracted, the melted metal never being allowed to chill in the furnace. Taps were located at the bottom of the furnaces, through which the molten metal ran out, to be formed into bars...". As noted above, the the 1906 book �The History of Bedford and Somerset Counties Pennsylvania� states that the Wellersburg furnace" ...eventually passed to the ownership of Ross Forward, of Somerset, who abandoned it about 1866.". Page 65 of James Moore Swank�s 1878 book �Introduction to a History of Ironmaking and Coal Mining in Pennsylvania� states �Somerset furnace, at Forwardstown, was built by Huber, Linton & Myers in 1846, and afterwards owned by G. Ross Forward; and Wellersburg furnace was built by the Union Coal and Iron Company, in 1856, under the management of G. Ross forward. All the furnaces and forges in Somerset county have been abandoned.�. Taken together, these two sources indicate that Ross Forward was involved with the Wellersburg furnace at both its beginning and end, and was involved with at least one other Somerset County furnace. Ross Forward "of Somerset, PA" was a co-inventor on an 1859 iron furnace-related patent that pertains to a perforated hearth that allowed steam to pass into the molten metal. The use of such a hearth is apparently why the 1859 book, quoted above, refers to the Wellersburg furnace as a "Steam Hot-blast Charcoal Furnace". The two photos that follow were provided by Mike McKenzie in 2009, and show a 60 pound chunk of iron that he found near the Wellersburg furnace years ago. As a preliminary educated guess, the piece of iron may be a runner from a pig iron ingot casting operation. Click here to see an example of spent media from the furnace. The stone furnace was built in 1855 by the Union Iron and Coal Company. The borough of Wellersburg was incorporated on August 28, 1856. A branch railroad was used for the needs of the furnace, and connected to a railroad that ran from Mount Savage to Cumberland. Because of the branch railroad, the first town in Somerset County to have rail communication was Wellersburg. The iron ore that was smelted at Wellersburg was procured from Savage Mountain. The pig iron output of the furnace was as high as 300 tons a month. The furnace employed about 200 men. 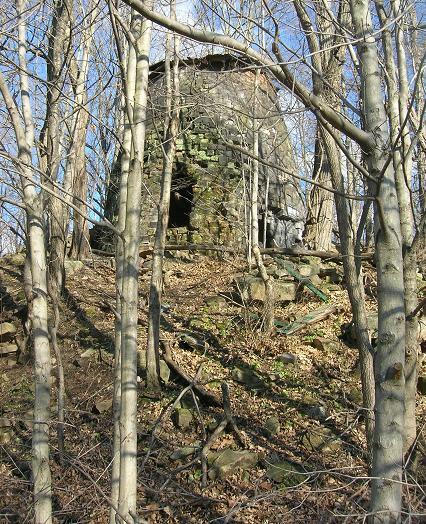 The furnace was abandoned in 1866, resulting in abandonment of the branch railroad that served it (Note-if it is true that the railroad was abandoned at one point, then it must have been resurrected later to serve the area coal mines). After the furnace was abandoned, the population of Wellersburg decreased. The map of Wellersburg from the 1876 Beers atlas marks the general furnace area as the "I.C. Canfield Furnace". I don't know exactly what to make of this; it may mean that a company tried to resurrect the Wellersburg furnace after it was abandoned, but that is pure speculation at this point. The August 1962 issue of the Laurel Messenger has an article on Wellersburg that states "The first town in Somerset County to have rail transportation was the village of Wellersburg. In 1855 the Union Coal and Iron Company built an iron furnace on Main Street. The ore supply came from Savage mountain nearby. A railroad was built to provide an outlet for products of the iron furnace, moving to easterm markets via Cumberland.". The construction of the furnace took place in 1856. The furnace was erected by the Union Coal and Iron Company. Either the construction, the company, or both, were under the management of G. Ross Forward (the sentence doesn�t make it clear). The blast engine wheel was fifteen feet in diameter. The iron ore was mined at a site that was approximately four miles from the furnace. It was delivered to the furnace in cars that rode on wooden rails. In 1866 the furnace was �blown out�. When one or both of the authors visited the furnace, the stone exterior was no longer intact. Part of the top of the exposed brick liner had been removed. The remaining part of the brick liner had been roofed over, a doorway had been cut into it, and it was being used as a chicken coop. When one or both of the authors visited the furnace, they observed foundations. The term �blown out� in the Sharp & Thomas article may not mean what we think it means. The May, 1965 issue of the �Laurel Messenger� contains an 1877 letter from Somerset County iron worker David Rodger to James M. Swank, editor of �Iron Age�. The subject of the letter was iron furnaces in Somerset County. In that letter, Mr. Rogers seems to use the term �blew up� to mean that the business just didn�t work out for some reason or other, rather than to neccesarily mean that something physical happened to the furnace. In one place, Mr. Rodger wrote the following in regard to the Somerset furnace: �William Hover and Rosse Forward, each of them blowed her about 2 months and blew up for want of ore and everything else��. Later on in the letter, Mr. Rodger wrote ��all them small iron works failed to pay their debts and blew up, and the laborer lost his wages.�. From these passages, one is led to suspect that back in those days terms like �blew up� and �blown out� may have just been expressions that are similar in meaning to the term �belly up� that we use today to indicate that a business failed. I don't know this for a fact, but the Rodgers letter certainly is suggestive of this interpretation. As noted above, Sharp & Thomas indicates that the blast engine wheel of the Wellersburg furnace was fifteen feet in diameter. My limited research to date indicates that at least two different basic types of machinery were sometimes used to produce the furnace blast. One basic type of blast machinery used large pistons that were driven by connecting rods via a large diameter wheel. Another basic type of blast machinery used a large diameter fan wheel that worked like the air circulation fan in a modern day home furnace. Click here for an 1850 illustrated description of one particular type of blast furnace fan wheel that reportedly originated in Philadephia. Photos that used to be published on another website showed the 24 foot wheel and connecting rod-driven pistons (tubs) of the historic charcoal-fueled Cornwall Iron Furnace in Cornwall, PA. The Cornwall furnace was built in 1742, but was extensively renovated in 1856-1857. Since the Cornwall furnace was rennovated about the same time that the Wellersburg furnace was built, the Cornwall furnace machinery could potentially be similar to what was used at Wellersburg. I don't know if the Wellersburg furnace used fan-type or piston-type blast machinery. if anyone has additional information on this topic, please let me know. 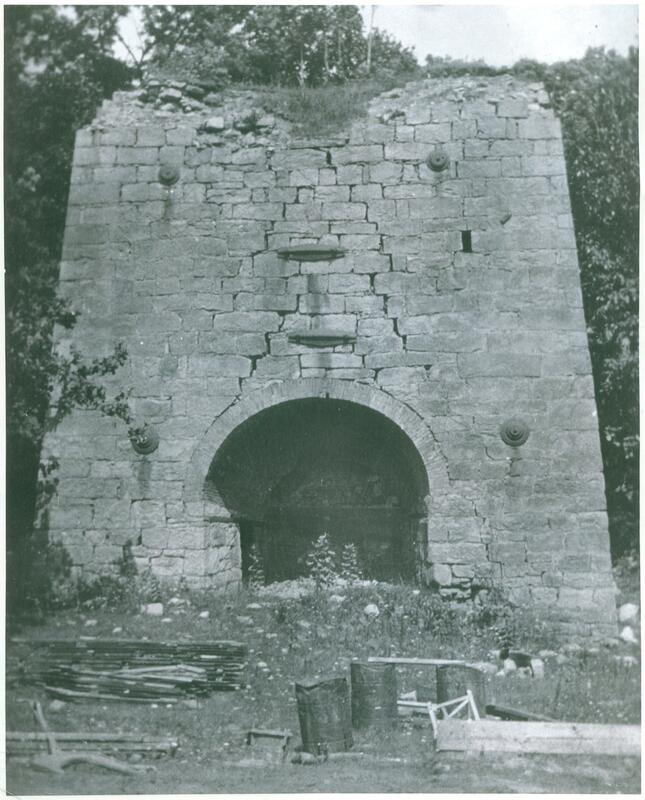 For information on other Pennsylvania stone furnaces, see Richard Parks' Iron Furnace website. In addition to photos, Mike McKenzie provided a significant portion of the site and photo analysis that is included on this page.